As a team we are settling down and beginning to ‘norm’ in the framework of ‘forming, norming and storming’. As minister for communications and water, I have introduced the concept of an ‘aggravation meter’ . This has been remarkably well received. Aggravation on a boat is the ‘dead elephant in the room’. It lies there festering until, after a while, it erupts. In a small place, it can be unpleasant. We are relatively aggravation free, especially now that I have dealt with the ‘snoring police’. My snoring is now talked about affectionately in some quarters. ‘Careful now with the aggravation meter’ has been heard on occasion , with a corresponding decrease in tension. I did the 6 to 9 shift this morning and commenced fishing operations early with much futile expectation. In desperation I dug out Jeremy’s lure he brought me safely from its own personal circumnavigation. It consists of an imitation squid being chased by an imitation fish. You can get the idea from the picture. It might not look out of place on a Christmas tree and it would probably catch as many fish there. Whilst I was drowning his lure, I decided to rig my biggest brightest squid imitation. Being as though there isn’t much to do on a boat in the doldrums , this attracted quite a crowd and various comments on my dexterity and general technical ability in this department. I burst the bubble by explaining that I had learnt it all on You Tube a week or two before I left. There was much, ‘small but perfectly formed’, stainless steel shackle envy. They don’t have any as small as mine on the boat but they come in useful. One of mine has already been purloined to repair something on the dinghy. Anyhow, feeling generous, I donated the said lure to the owner’s wife who insists on fishing with a cut up washing up glove called ‘ Marigold’. 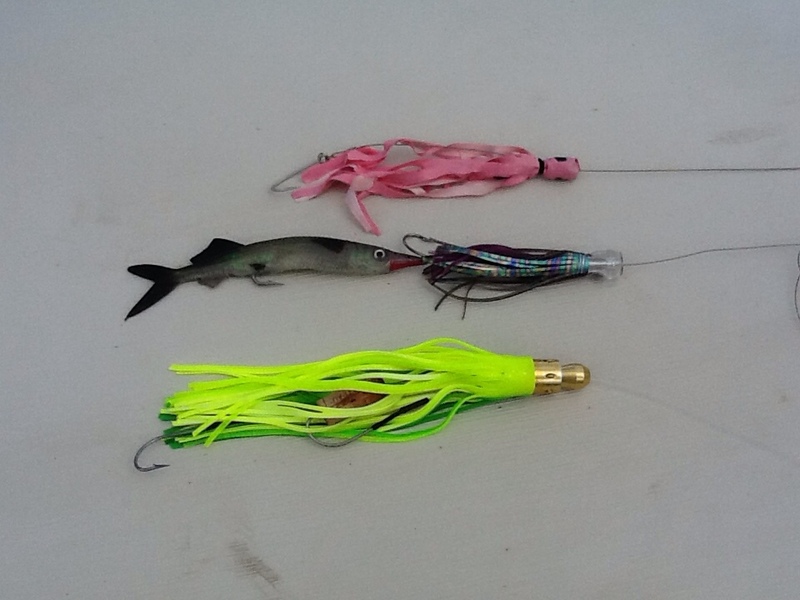 Unfortunately,bloody Marigold has outfished all my expensive hi tech lures with a trolling score of 1 – 0 to date. Hence my secret desire to level the playing field. Owner’s wife is suspicious, but having accepted my newly christened offering called ‘Daffoldil’ she felt obliged to give it a go. Result. The opposition’s main striker was off the field for most of the afternoon. Enjoy the rest Marigold. By this time the sun was above the yard arm and cold beer was summoned with a few freshly made drop scones plus canned cherries ( for my gout ) for lunch. It is pretty sweaty here in the doldrums and my German crew mate ( he is the hygiene minister) was commenting on my slightly smelly travel towel. The water minister has taken it as a serious duty to set an example to the hygiene minister on general conservation of water by not washing much and drying sweat off with said towel. In fairness, the towel was a bit off. Anyhow, feeling industrious, I set about doing some hand washing. You get a bucket, fill it with sea water chuck in some powder and either dance on it ,if the bucket is big enough ,or pound it with a stick. I think it is something they used to do in the old days but has died out now. Then you give it several rinses in more sea water before a final rinse in precious fresh water. Towards the end of this process, I came over all funny. My lips became hugely swollen to the point it was difficult to speak and then I broke out in unbelievably itchy hives all over my body. I was allergic to the washing powder. I knew there was a reason I avoided that department at home and this was clearly why. I took 4 antihistamine , had a shower and lay down and am pleased to say that I am now back to normal. Tomorrow, I am going to put the clothes I washed into a net and tow them behind the boat to get rid of any residue before a final rinse and a new fragrant me. I am sailing the boat as I write this. She is being nursed along at a sprightly 4.7 knots in just 9 knots of wind, in the pitch dark broken by a beautiful moon. We will cross the equator tomorrow with wind and luck and Galapagos by Sunday or Monday. Had a great night out with Sarah, Lou and Lis last Tuesday at The Red Lion, ‘Open Mike’… doing it all again tonight. Thanks Di. Hard work getting the blogs posted. Internet in Galapagos is doggy do. Thanks for looking after Sarah. She is a bit shy at first, but a firm friend over time. Say hello to Trevor and tell him I am not charging him for the Guggenheim plug. Spoke to Keith last week and apparently the Sailors has been completely refurbished and the rooms are unrecognisable! Shame the marigold is still outfishing the hi-tech, you know I’m still backing the Christmas decorations…….though I may now be tempted to take a marigold to Cuba with me. Shame the marigold is still outfishing your hi-tech……..I’m still backing the hi-tech for the long haul though, I’m sure your Christmas decorations will deliver in the end.